Logging more than 32 days in space—770 hours and 27 minutes—astronaut Steven Hawley has flown on five space shuttle missions. 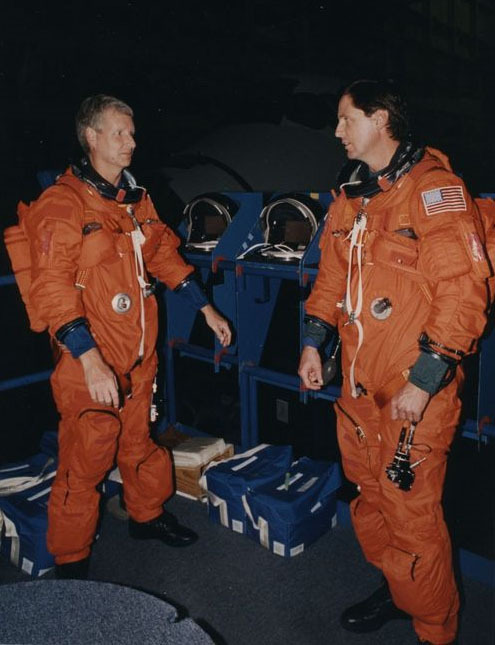 He served as crew on missions that deployed the Hubble Space Telescope, serviced the space telescope mission, and deployed the Chandra X-ray Observatory. Hawley was born in 1951 in Ottawa, Kansas, but grew up in Salina. After graduating from Salina High School, Hawley attended the University of Kansas where he graduated with honors in 1973 with degrees in physics and astronomy. He received a doctor of philosophy in astronomy and astrophysics from the University of California in 1977. Dr. Hawley was selected to join NASA's astronaut program in 1978. After he had completed five space shuttle missions, Hawley became NASA's director of flight crew operations Johnson Space Center in Houston. He continues an involvement as director of astromaterials research and exploration science at NASA, overseeing research in planetary and space science and is responsible for NASA’s collection of materials that include the moon rocks, comet dust, Martian meteorites, and solar wind particles. In fall 2008 Hawley returned to Kansas to teach and to promote education in science and math at the University of Kansas. He was named the Native Sons and Daughters' Kansan of the Year in 1992.